Contains: Cranberries, Vitamin C, Soya protein, Arctostaphylos (Uva-Ursi), Opuntia Ficus Indica (Indian fig). Cranberries, Uva-Ursi and Vitamin C – increase the acidity in the body and thereby prevent urinary tract infections. Soya protein and Indian fig cause the hormone glands to naturally produce estrogen. The shortage of estrogen decreases natural muscle tonus and among other effects might cause weakening of the urinary bladder muscles resulting in leakage. 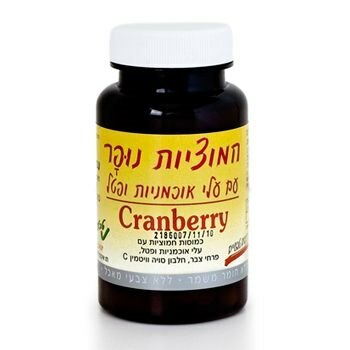 After using "Nufar Cranberries" for two to four weeks, the muscle tonus of the bladder will strengthen and involuntary urine loss is stopped. The cranberry plant functions as a natural anti-oxidant and lowers the risk of suffering from heart disease and cancer. "Nufar Cranberries" improve the functioning of the kidneys and prevents kidney problems. Directions for use: 2 tablets per day.